Judith brings her 30 years of Alexander Teachnique teaching experience to help you move with greater ease and flexibility. For over 100 years the Alexander Technique has helped people improve their health, and how they perform in their day to day lives, whether an actor on stage, an athlete in the field, or a professional at a conference table. Lessons in the Alexander Technique teaches you to understand and recognize your body’s natural capacity for balance. Through improved carriage, you grain greater fluidity in movement that eases stress on both mind and body. 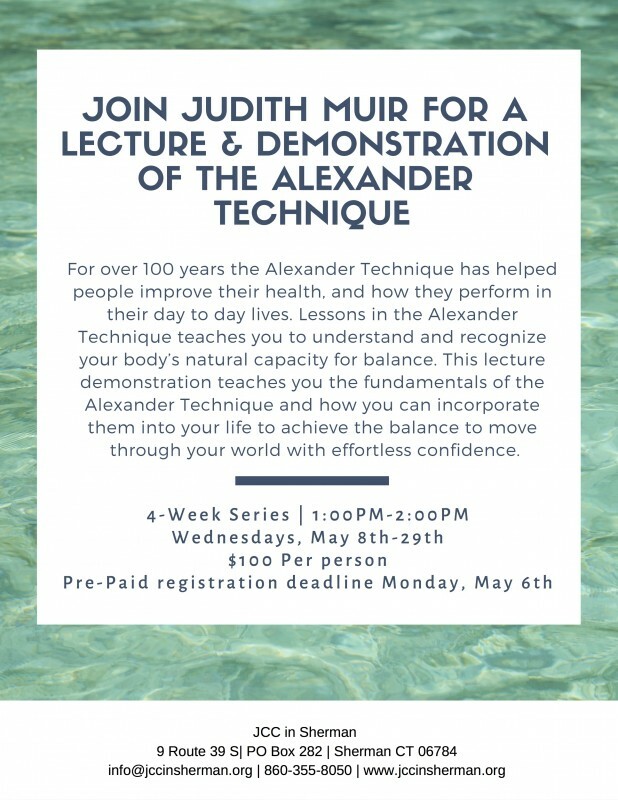 This lecture demonstration teaches you the fundamentals of the Alexander Technique and how you can incorporate them into your life to achieve the balance to move through your world with effortless confidence. LIMITED SPOTS AVAILABLE FOR THIS EVENT!